The setting is Alexandria, Mississippi, where one Mother's Day a little boy named Robin Cleve Dufresnes was found hanging from a tree in his parents' yard. Twelve years later Robin's murder is still unsolved and his family remains devastated. So it is that Robin's sister Harriet—unnervingly bright, insufferably determined, and unduly influenced by the fiction of Kipling and Robert Louis Stevenson—sets out to unmask his killer. Aided only by her worshipful friend Hely, Harriet crosses her town's rigid lines of race and caste and burrows deep into her family's history of loss. 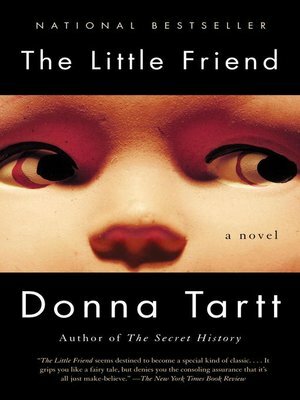 Filled with hairpin turns of plot and "a bustling, ridiculous humanity worthy of Dickens" (The New York Times Book Review), The Little Friend is a work of myriad enchantments by a writer of prodigious talent. Donna Tartt was born in Greenwood, Mississippi, and is a graduate of Bennington College. She is the author of the novels The Goldfinch and The Little Friend, both of which are international bestsellers.